« Festival of History 2012. Bringing the History of England Alive. It’s the Festival of British Archaeology – this is your chance to meet a real archaeologist and to uncover artefacts from Old Sarum’s history. Enjoy a weekend for all the family with plenty of hands-on activities and crafts to keep everyone busy! 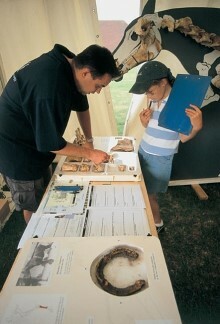 Take part in a mini-dig and have a go at identifying objects lost over time.